When the world first met Miley Cyrus as Hannah Montana, with her mountain of highlighted hair, giant teeth, and a mouth full of y’alls, no one suspected that some seven years later they’d be watching her twerking in a unicorn suit, sporting a bleached blonde buzz cut and a smattering of tattoos, bizarrely center stage and more relevant than before. Seemingly overnight, Miley Cyrus has mysteriously acquired some sort of cool-kid street cred, transcending her previously marketed aw-shucks Southern sweetness, her father’s epic ‘90s mullet, and that “Party in the USA” song. Flip Collective just started its summer season, and that means I’ll be back with a few pieces. Like this one, “The World’s Second Most Difficult Triangle,” about unicorns perfect men. 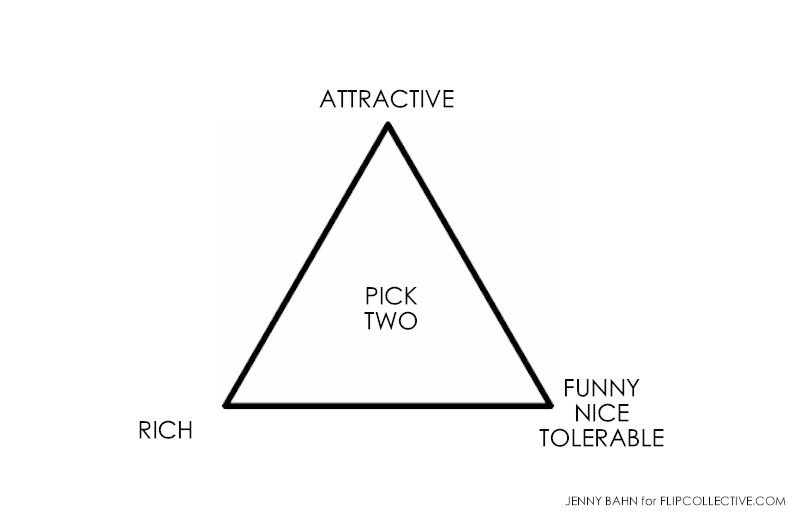 There’s a graphic out there — I’m sure you’ve seen it — often referred to as “The World’s Most Difficult Triangle” or “What I Want in a Woman.” It is a simple, black and white rendering of a shape, accompanied by the adjectives “intelligent, emotionally stable, good-looking,” as well as a directive in the center: “Pick two,” it says, inferring one inherent, tragic sacrifice. Intelligent and emotionally stable? She’s likely got the face of a horse. Good-looking and intelligent? Watch out for when that nut job stabs you in the hand with a fork. Good-looking and emotionally stable? Hope you’re into girlfriends who are as dumb as Golden Retrievers. Click here to read the rest of the piece on Flip Collective.